In the first call for Erasmus + projects in 2018 the "iFarm Organic" project was approved funding for 2018 and 2019! It is great news and enables people to spend more time on the farm project than the three month limit we had till now due to the EU and Slovene legislation. And the experience of the farm project will be more structured and really empower volunteers in his/her ability for personal growth in the field of farming/interesting social concepts/life skils. The volunteers will spend in 2018 six months (May to November) and in 2019 eight months (March to November) on the farm project. They can be female or male from 18 to 30 years old. The EVS project is financially supporting living costs (accomodation, food, monthly allowance of aprox. 80 eur per month). Are you interested to learn about local sustainability, self-sufficiency and organic farming in practice and theory? Do you like to spend your days doing meaningful work supporting interesting and innovative ideas and local projects in the field of organic farming? Then be a part of our team of the "Drustvo EkoPot" (Association Organic Way)! 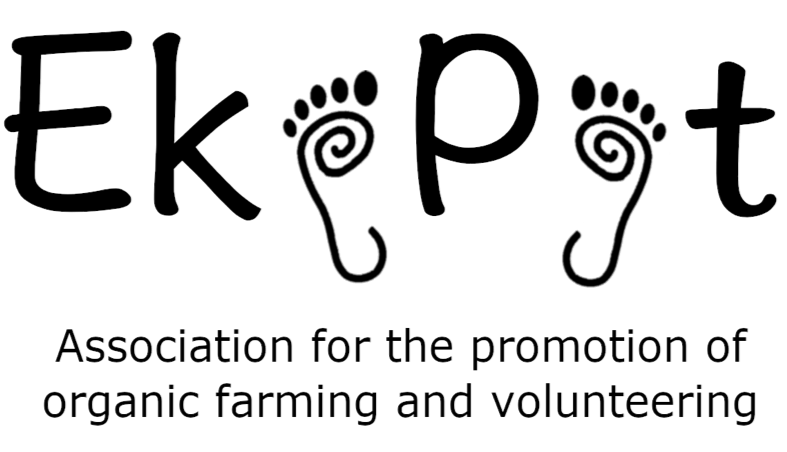 The association is a non-government non-profit organization with the aim to assist and help to evolve in all kinds on farm projects which include everything from day-to-day on a farm in the frame of locally sustainable projects like CSA (Community supported agriculture), a co-op project and direct marketing. You also gain insight into the running of a very active farm with more than 80% self-sufficiency, it is certified organic and biodynamic with vegetable (more than 60 different vegetable varieties), fruit (apples, berries, nutfruits) and field crop production (spelt, einkorn, emmer, kamut, millet, buckwheat, maize, etc. ), processing of more than 100 products (baking bread, processed fruits into jams, spreads or canned vegetables for the winter, processing and packaging of flour, cereals, porridge, etc.) and marketing on a 12 ha family run farm. Apart from the farm experience we offer a wide variety of different projects for young people e.g. sustainable building, media work, seed production, excursions, work-shops ... The target groups are all kinds of people from all kinds of backgrounds (cultural and social-economic) with a clear focus in gaining knowledge of a sustainable daily life, which promotes the local environment and development. Our aim is to introduce our target groups to sustainable life skills and inter-cultural exchange through the help of the EVS. - we host students, wwofers (Willing Workers on Organic Farms), scouts in a Job-shadowing project and other volunteers through the year. The main goal is to create an environment where it is possible to experience and be a part of a farm as a organism and get the answers not only to how but mainly why some things are as they are and what can be done to help it evolve into an organism. in a safe and structured environment. One of the pilars of the activities will the the personal growth of the volunteers with the own project which can be diverse and completely in line with the needs and wishes of the volunteer. The NGO promotes the importance and practical skills important in the efficiant organic farming, bio-dynamic agriculture, production, processing and marketing through lectures, seminars, workshops, excursions for more than 250 people every year. The NGO is located in the Jarenina vilage (the Podravje region) which is easily connected by public transportation (bus stop is 200 m from the NGO) to all the main cities of Slovenia. Jarenina is a vilage of 1.200 inhabitants and is close to (15 km) to the second biggest city of Slovenia called Maribor (with 90.000 inhabitants) with a hospital, theaters, music festivals in the summer (Lent festival), cinemas and enables to be connected by bus or train to all parts of Slovenia and neighboring countries.. Maribor has a strong base of different NGO's from arts to seed conservation. The farm has a main house with a community kitchen and a temporary living room. The main house has an house extension with two rooms and a bathroom for up to four volunteers, to enable some privacy and the separation from the farm. It can be best described as a hostel like accommodation. In 2018 we plan to build a outside living space (a cob oven for pizza and cooking outside) where time after work can be spent with the members of the whole farm. Appliancess which are needed (kitchen, washing machine, dryer, vaccum cleener, etc.) are located in the main house and can be used by everyone. The activities are structured through the week and depend a lot on the seasonal and climate conditions. A week is structured in five days of in practice farm experience and organizational and managing activities. The afternoons and weekends are always free for personal activities. Due to the fact that the accommodation is on the farm there is no need for daily traveling and consequently this enables less stress and more free time in the daily routine (which accounts on average for seven hours of volunteering a day). From Monday to Friday the day starts at 8 a.m.. At 12 a.m. we have a small lunch until 1 p.m. At 4 p.m. there is a big lunch with all the people of the farm. - within the activities a "zero waste" project is being implemented since 2017. Please share the news and if you have any questions please write us at drustvo.ekopot@gmail.com or call us 00 386 31 368 162 (Maja) or 00 386 41 960 972 (Matjaž). We look forward to build a sustainable model in the field of environment and social development with YOU!